The Sramanas movement, which originated in the culture of world renunciation that emerged in India from about the 7th century BCE, was the common origin of many religious and philosophical traditions in India, including the Charvaka school, Buddhism, and its sister religion, Jainism. The Sramanas were renunciants who rejected the Vedic teachings, which was the traditional religious order in India, and renounced conventional society. Siddhartha Gautama lived during a time of profound social changes in India. The authority of the Vedic religion was being challenged by a number of new religious and philosophical views. Gautama was one of the many critics of the religious establishment. The Mauryan Indian emperor Ashoka the Great (304–232 BCE), who ruled from 268 to 232 BCE, turned Buddhism into the state religion of India. He provided a favourable social and political climate for the acceptance of Buddhist ideas, encouraged Buddhist missionary activity, and even generated among Buddhist monks certain expectations of patronage. Theravada is the single remaining representative of the eighteen (or twenty) Nikaya schools of Indian Buddhism, which are sometimes referred to by the controversial term Hinayana. Theravada is now practiced mainly in Sri Lanka, Myanmar, Thailand, Cambodia, and Laos. Another prominent Nikaya school, was the Sarvastivada, much of the doctrine of which was incorporated into Tibetan Buddhism. It included one of the main branches of Indian Abhidharma that was instrumental in the creation of Yogacara doctrine. Its system of monastic rules Vinaya is still used in Tibetan Buddhism and is also somewhat influential in monastic Chinese Buddhism. For a full discussion of Mahayana Buddhism, please see Mahayana. Yogacara founded by Asanga and Vasubandhu. Also known as Cittamatra, Vijnanavada (Mind Only, Consciousness-Mind Only). Tathagatagarbha A tenet of Indian and East Asian Buddhist thought based on the third turning of the wheel of dharma and central to Yogacara. A form of Indian Buddism that emerged in roughly the 7th century AD and later became widespread in Tibet, and also found in Japan. For a full discussion, please see Vajrayana. For a full account of the spread of Buddhism in India and beyond, see the History of Buddhism and the Decline of Buddhism in India. Buddhists form merely 0.8% of Indian population and most of them are concentrated in Eastern India and its neighboring countries. The number of Indian Buddhists remains quite small; under 10,000,000 persons (excluding refugees from elsewhere) in a country of over 1,000,000,000. Revival movements have been attempted with limited success. See Neo-Buddhism for a full account. 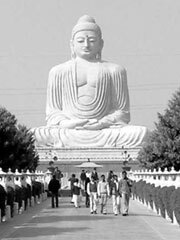 Neo-Buddhism A 20th century revivalist movement among bahujan caste and untouchable Indians, initiated in 1956 by Bodhisattva Dr. B. R. Ambedkar.